The first Crush 40 song was "Open Your Heart", originally recorded with Japanese singer Eizo Sakamoto for the theme tune of Sonic Adventure for Sega's newly released Dreamcast console back in 1998. With Johnny Gioeli on board, this was the beginning of a long relationship between Jun and Johnny that would eventually lead to the formation of the band, and their first album Thrill of the Feel. The next appearance of the band was in 2001, when Sonic Adventure 2 was being worked on in time for Sonic's 10th anniversary. Commitments to other bands meant Naoto and Hiro could not take part, so Katsuji and Takeshi were brought in to record songs for the game. Live and Learn was the result of the band, an old fashioned hard rocker but with modern production. All went quiet during 2002, then just under three years from the initial release, under the new name Crush 40, the European version of the Sons of Angels album was announced. It was stripped of the instrumentals, and in turn included both prior Sons of Angels songs from the Sonic games and two other songs featuring vocalists Tony Harnell and Ted Poley. During 2003, Sega announced the first multiplatform Sonic game, Sonic Heroes. Once again, Jun was the sound director, and began writing, this time as a collaboration with artists such as Gunnar Nelson, Julien-K, Kay Hanley and of course Johnny Gioeli. This time, there were two new Crush 40 songs: the theme tune "Sonic Heroes (song)", a bright, melodic song and in contrast "What I'm Made Of", a distinctly dark hard rock song with metal sensibilities. Sonic Heroes was released at the end of 2003 in Japan, and in early 2004 in the United States and Europe. In 2005, two new Crush 40 songs appeared in the game Shadow the Hedgehog. In contrast with the theme to Sonic Heroes, the theme to Shadow, "I Am... All Of Me", has a dark tone while "Never Turn Back", the true ending theme, has a somewhat brighter style when compared to "I Am All of Me". In 2006, Crush 40 performed a remix of "All Hail Shadow" for Sonic the Hedgehog. The song was previously done by Magna-Fi for Shadow the Hedgehog. The bridge of the remix contains part of the guitar riff that was used in "I Am... All Of Me". Also in 2006, Crush 40 performed a remix of "His World", the main theme of Sonic the Hedgehog. The song was not used in the game, but can be found on the Sonic the Hedgehog Vocal Traxx audio CD. In 2008, six songs by Crush 40 appeared on the CD True Blue: The Best of Sonic the Hedgehog: A new mix of "Live & Learn", "Sonic Heroes", a new mix of "What I'm Made of...", "Open Your Heart", Crush 40's version of "Seven Rings In Hand" from Sonic and the Secret Rings, and a collaboration with Bentley Jones entitled "Open Your Heart (Crush 40 vs. Bentley Jones Remix)". In 2009, Crush 40 composed four songs for the game Sonic and the Black Knight, the first of which was entitled "Knight of the Wind". The song made its official debut during the Tokyo Game Show 2008, first appearing in the game's first trailer, and an extended version was later heard during a live performance by Crush 40. In addition to the main theme, they performed boss battle songs "Fight the Knight", and "Through the Fire", as well as the game's ending theme, "Live Life". In the game's vocal album, entitled Face to Faith: Sonic and the Black Knight Vocal Trax, they contributed a cover of the game's final boss song "With Me", which was subtitled the "Massive Power Mix". In late 2009, Crush 40 released a compilation album, The Best of Crush 40 - Super Sonic Songs. The collection spanned much of their Sonic resume, as well as select songs from their eponymous album from 2003. Also featured are a cover of "Un-gravitify", a cover of The Cult's "Fire Woman", as well as an original composition entitled "Is It You". 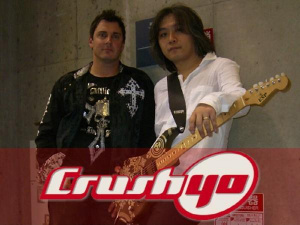 In 2011, Crush 40 released the charity single Song of Hope, a song written to support and in honour of those who suffered from the earthquake and tsunami that occurred in March 2011 in Japan. Later that year both Song of Hope and The Best of Crush 40 - Super Sonic Songs were made available on iTunes, the latter having additional tracks not originally featured on the CD version. The bonus tracks included a version of "Free", the theme song to Sonic Free Riders, their version of "With Me" originally avilable on Face to Faith: Sonic and the Black Knight Vocal Trax, and their version of "Seven Rings In Hand" originally from True Blue: The Best of Sonic the Hedgehog. The 20th Anniversary release of the Sonic CD OST also included a version of "Sonic Boom" recorded with Cash Cash known as the "Crush 40 Vs. Cash Cash" mix. On March 27th, Jun announced that three new songs would be released as an EP, and a sample was posted on Crush 40's YouTube. Crush 40 updated their website announcing the EP would be released July 4th, 2012 on iTunes, and a physical release would follow on August 1st. The tracklisting was revealed to be "Sonic Youth", "One Of Those Days", "Song Of Hope" and "Rise Again". This page was last edited on 12 November 2012, at 17:59.